Captain Olimar using his whistle on three idle Pikmin. This article is about the whistle used by the leaders. For other uses, see Whistle (disambiguation). To do: Some animated gifs would be awesome. The whistle (フエ?) is a main part of the gameplay in the Pikmin games. This is the primary way of calling idle Pikmin, the secondary way being a leader bumping into them. Leaders can also be called into the group via whistling, but only in Pikmin 3 can they be called via bumping. Whistling can also be used to instantly rescue Pikmin who are suffering from a hazard, such as fire, call drowning Pikmin to land, and help Pikmin who are about to fall prey to the Vehemoth Phosbat or Sandbelching Meerslug's vortex attacks. It'll blow some sound waves towards the cursor when used by pressing / in the first two games, and / / in Pikmin 3. The longer the button is held, the wider the call's radius, up to a size and time limit. The maximum radius (unmodified by the Mega Tweeter) is about the size of an Onion's circular landing pad. The whistle in Hey! Pikmin works differently from the main games. 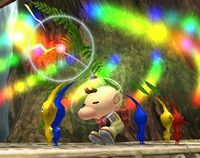 Instead of blowing sound to a point the player can control, using the whistle calls all Pikmin on-screen to rush to Olimar's side, assuming they are not working on an obstacle. There are different commands that leaders can do that also play whistle sounds. Pikmin can be separated intro groups of their own type with a simple dismiss command. A third type of audio order also exists, albeit not directly related to the whistle. On the first two games, when is tilted, a small tune is heard and the Pikmin will move in the direction the stick is held; the farther the stick is tilted, the farther they'll move. On the New Play Control! versions, must be pressed, and the Pikmin will move towards the cursor's position. In the first two games, idle or working Pikmin and leaders jump to attention with a grunt when called by the whistle and run to the leader immediately after. In Pikmin 3, Pikmin and leaders still immediately acknowledge the whistle, but do not actually start running until the whistle's radius is no longer around them. When the button is pressed, the game takes a couple of frames to register the press and actually make the leader start whistling. The whistle grows in size for a few frames. The whistle is at maximum reach. The whistle particles vanish, but the leader is still in their whistling animation. After all this, the leader finally returns to normal. The final state only exists in the first Pikmin game, and in Pikmin 3, when the whistle is at its maximum radius, it also starts growing vertically. The following table lists the maximum duration of each state. To note is that none of the upgrades affect these times. Alph calling Pikmin back with his whistle in Pikmin 3. Visually, when using the whistle, some manner of circular shape will appear around the focus point, in order to indicate the area of reach. The whistle's graphical representation depends on the game. 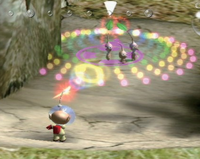 In Pikmin and Pikmin 2, a spectrum of colored bubbles appears when whistling, rotating around the cursor in a ribbon-like pattern. In Pikmin 3, a blue, digital-like dashed circle appears, and if the cursor is held for longer, a transparent cylindrical column grows into the air and below ground, indicating that the whistle is then reaching Pikmin above and below the cursor, such as Winged Pikmin. In Pikmin 2, Olimar, Louie and the President all have different calling whistles and group move fanfares, but share the same dismiss whistle. Olimar's whistles sound like a normal pea whistle, Louies' resemble a toy train whistle, and the Presidents' resemble a car's horn. In Pikmin 3, whistles are integrated into every leaders' helmets, and are the same for all characters: a regular pea whistle like Olimar's. Sometimes, the whistle is limited to prevent the player from breaking the game's normal flow. This happens in Pikmin 2 where leaders in day 1 cannot whistle each other or the other Pikmin until they reunite. It's also impossible to whistle Blue Pikmin before getting Yellow Pikmin, in New Play Control! Pikmin 2 exclusively. In Pikmin 3, the game sometimes locks the whistle too. On day 1, Charlie cannot whistle until he discovers the large group of Yellow Pikmin, and Alph cannot whistle before discovering the three first Red Pikmin. On the first day the Distant Tundra is explored, Brittany cannot whistle until she meets the first Yellow Pikmin. Using a certain glitch, it's possible for Brittany to exit the cave without unlocking Yellow Pikmin. If the introduction cutscene wasn't triggered, the whistle will remain locked until the end of the day, although it's still possible to whistle by grabbing a Pikmin. Pluckaphone: allows the leaders to uproot Pikmin just by whistling them. Mega Tweeter: allows the whistle to call Pikmin in a wider radius. The whistle in Hey! Pikmin works differently from the whistle in the main games in the series. There is a button on the touch screen, and when the player wants to use the whistle, they must tap it. The whistle will only work if Olimar is idling (on the ground, or even when on a vine, underwater, etc. ), or is walking. Upon being used, a voice will be heard saying "Hey! ", although it doesn't seem to match Olimar's voice. The pitch of this sound clip is also randomized. After a small delay, Olimar will blow his whistle proper. The whistle is normal-pitched in most circumstances, but high-pitched if the Pikmin around are in danger of dying. When used, all Pikmin that are on-screen and are not carrying something will run to Olimar's side. 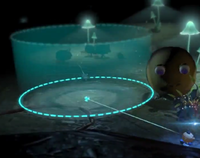 This is the player's way of calling new Pikmin hiding behind objects like bushes, as well as the main way to get them to return to the captain when they are fighting. It can also be used to force Pikmin that are casually walking to Olimar to run instead, meaning one can blow the whistle to get Pikmin to run away from danger much faster. Only the Pikmin that are on-screen, or slightly away off-screen will hear the whistle. In addition, Pikmin that are in a different part of the area but still visible on-screen will not be able to hear the whistle. This forces the player to have to go to the part of the area where they are at before they can be called over. In the Nintendo Land attraction Pikmin Adventure, pressing / or tapping the call icon on the Wii U GamePad will cause the Mii controlling Captain Olimar to whistle all Pikmin – including the other player Pikmin – to him. This will cause all player Pikmin to stack on top of Olimar's head, which Olimar can now throw at enemies or other obstacles. Pikmin can refuse being called by shaking the Wii Remote. Much like in the Super Smash Bros. games, Pikmin can be called from anywhere. Olimar using his down special move in Super Smash Bros. Brawl. This article or section is a short summary on the move Pikmin Order. In Super Smash Bros. Brawl and Super Smash Bros. for Nintendo 3DS and Wii U, Olimar's down special move is called Pikmin Order. When used, Olimar briefly blows his whistle around him. Any Pikmin that are stranded will quickly jump back next to Olimar, regardless of their distance to the leader. Then, all the Pikmin are grouped by type. If this move is used while they are already grouped, it'll send the next group to the back of the line. Interestingly, this move has some super armor frames, which means that, with good timing, one can use this move and suffer no knockback from powerful attacks or even Final Smashes. To do: Upload sounds for the missing games. The whistle in Pikmin 2. The whistles can clearly be seen on each leader's helmet. Portuguese (NoE) Apito Whistle Translation taken from the Pikmin instruction manual. Svistok Whistle Name taken from Nintendo Russia's official twitter. ↑ YouTube video showing how the whistle remains locked if the introduction cutscene is skipped. This page was last edited on March 10, 2019, at 12:43.